John Shelter and crew have, once again, further degraded the integrity and services of the Arcata Endeavor, the only food bank/pantry in Arcata. People who cannot PROVE THAT THEY HAVE A RESIDENCE in Arcata cannot get a food box. Do the funders know that homeless people are banned from receiving food? Do the community donors who donate food and money know that homeless people will get NOTHING from those donations? The poverty pimps have got to go. The mission of the food endeavor is to feed hungry people. This is disgraceful. And notice that in the “Community Resources” page, the Arcata Endeavor is advertising the link for online Sun Valley Floral Farms Job Applications! The poverty pimps have got to go. People getting fat while refusing to share with hungry people?! SAN DIEGO — 10News has uncovered troubling details in the background of a police officer accused of going rogue and taking his anger out on homeless citizens in San Diego. Officer Anthony Bueno, an 11-year veteran, remains on the job pending an investigation. Bueno is accused of slashing a homeless San Diego couple’s tent in December. Homeless San Diegan Malia Mason said the police officer, who was upset she had put up a tent during a rainy night, used a knife to slash her tent and cords. “He was slicing as I climbed out and the knife came within inches of my face,” said Mason in an interview in December. Homeless advocate David Ross said the tent-slashing incident was one of five similar incidents documented against the officer during a two-week span in November.”It’s shocking and disappointing,” said Ross. 10News learned Bueno was arrested in 2007 on four counts of misdemeanor battery on a fellow police officer while on duty. Few details of the incident are known, but in that case, Bueno pleaded no contest to a lesser charge and was allowed to stay on the force. Last year, Bueno was on the scene of the death of a homeless man in East Village. Another homeless man who is accused of resisting arrest said Bueno was “joking and speaking very disrespectfully” about the deceased man and provoked the incident. 10News was told the primary reason for keeping Bueno active was because several witness statements and surveillance video cast doubt on Mason’s version of events. “I don’t believe that. Each of the interviews I conducted were consistent. They were scared of this officer,” said Ross. Though the tent-slashing investigation should be wrapped up soon, a second internal probe is possible into the accusations that Bueno was making fun of a deceased homeless man. Meanwhile, a judge will soon decide if the details that 10News uncovered will be allowed as evidence in the trial of the homeless man accused of resisting arrest. WRAP has been documenting the increases of mentally ill people in local jails as a result of diminished funding for mental health treatment and housing, escalation of “nuisance crime” enforcement by police and private security, and expansion of mental health courts. The scale of this issue is enormous: it is reported that the LA county jail alone houses 3,000 mentally ill people a night. According to the Bureau of Justice Statistics, as many as 64% of people in jails nationwide have mental health problems. In the 1980s and early 1990s, people with severe mental illness made up 6-7% of the jail population. In the last 5 years, this percentage has climbed to 16-30%. Nationwide, there are three times as many people with mental illness in prisons as there are in hospitals; 40% of people with severe mental illness have been imprisoned at some point in their lives; and 90% of those incarcerated with a mental illness have been incarcerated more than once and 30% have been incarcerated ten times or more. We at WRAP see this ever-increasing incarceration of mentally ill people as part of a trend toward using the criminal justice system to address health and socioeconomic needs. On the ground, this means that mentally ill homeless people who lack adequate access to housing and treatment services are vulnerable to getting caught in the criminal justice system, especially arrest or citation under local “quality of life” or “nuisance crime” laws that include sitting/lying on sidewalks, panhandling, and loitering. Oftentimes, the seriousness of these infractions is escalated to “failure to appear” bench warrants, which require jail time. To gain a clearer understanding of the scope of the problem, we are conducting outreach to self-identified mentally ill people, service providers, justice system employees, lawyers and researchers. We have also conducted a literature review of Department of Justice reports and periodical pieces. We were stunned to learn that never before has there been systemic outreach to self-identified mentally ill homeless people about this issue. During the month of August 2010, WRAP did street outreach with 253 self-identified mentally ill homeless people in six cities (Portland, San Francisco, Oakland, Berkeley, Los Angeles and Denver). The National Consumer Advisory Board of the National Health Care for the Homeless Council is doing 350 more in seven cities across the country. We currently have a small sampling of online surveys from 36 frontline service providers. If you or your organization would like to participate in either of these surveys contact staff at WRAP. The initial responses tell us we need to bring together all the concerned members of local communities and finally start to reverse this trend. 76% reported being stopped, arrested, or cited due to “quality of life” offenses. 60% reported being harassed by private (Business Improvement District) security. 35% reported having ignored tickets issued against them. 59% reported having Bench Warrants issued for their arrest. 22% reported having outstanding warrants at the time of the survey. 21% reported being incarcerated while 5% reported being referred to a program when brought before court. 29% reported losing their housing or being discharged from a program due to incarceration. Almost 20% of service providers report that their clients’ interactions with police occur because they appear to be homeless. 30% of service providers report that their clients interact with police because they are loitering, 16% report interaction because of jaywalking, and 16% for trespassing. 53% of service providers report that approximately 20% or more of their clients have bench warrants against them. 44% of service providers report that 50% or more of their clients have outstanding tickets. 74% of service providers report that at least 70% of their clients have been arrested. By looking at and analyzing the experiences of the clients and of the service providers and relating these to the research that been done on issues of decreasing access and increasing criminalization, we will lay the foundation needed for all of us to come together and finally begin to dispel the myth that mental illness and homelessness are the result of people choosing a lifestyle and that service providers are incompetent. These claims have gone unanswered far too long and the result, as we all see, is killing us. While re-funding housing and treatment services might seem to be a logical response, local and state governments, with the support of the Federal Department of Justice have instead been implementing Homeless and Mental Health courts. In the last 10 years, the number of Mental Health Courts in the U.S. has increased from 4 to 120. In theory, the mental health court system is a collaborative effort between judges, prosecutors, defense attorneys, caseworkers, and mental health professionals aimed at figuring out an appropriate treatment plan for the offender. Some recent studies suggest that mental health courts substantially reduce recidivism, and others have shown that participation in mental health court increased defendants’ access to long-term care. Which would seem to disprove the whole services resistant argument, which is so prevalent in the creation of these courts. WRAP seeks to ensure that jails do not replace community-based mental health treatment services and that the hundreds of millions of dollars that are currently funding the whole bureaucratic process of criminalizing people instead be applied as an initial down payment towards the housing and treatment that is not only much more humane, but in the long run, much more affordable as well. We’ll use our collective strengths, organizing, outreach, research, public education, artwork and direct actions. We will continue to expand this network of organizations and cities and we will train ourselves to ultimately bring down the whole oppressive system of policing poor people and poverty as a non-human broken window to be discarded and replaced. Today the 9th Circuit Court of Appeals granted me a new trial against the City for its actions in harassing, excluding, and arresting me for making a mock-Nazi salute at a March 2002 City Council meeting after the Mayor had threatened a diminutive peace activist with arrest for stepping up to the microphone in search of her Oral Communications time. I’ll be posting a link to the full decision shortly, But in the meantime, I invite Free Speech advocates to savor a few of the phrases used by the unanimous court as well as a few stronger ones used by the two judges who would have defended my rights even further. In an earlier article (“9th Circuit Court Slaps Santa Cruz City Attorney in Mock-Nazi Salute Case” at http://www.indybay.org/newsitems/2010/06/28/18652079.php), I I discuss the 10-judge hearing down in Pasadena this summer and how badly City Attorney Kovocevitch’s arguments came off. For once, it seemed, judges were actually listening. This case concerns the civil rights of advocates in a stacked forum (City Council) which has traditionally been hostile to homeless civil rights on the streets. Many people rightly wonder, “why bother with City Council anyway?” After years of frustration, I don’t really have a good answer. A body stacked with neo-liberal gentrification maestros masquerades as progressives or “moderates”. It has legislated away civil rights for the poor on the streets and continues to make the act of sleeping at night outside (in a city with no shelter for 85% of its homeless). The point: to establish a “comfort zone” for the frightened and prejudices, whose legitimate concerns about housing, health care, jobs, the war, and the economy are being displaced onto “the smelly homeless”. “Quality of life” is to be regained under this deluded theory by driving the poor out of sight and out of town instead of ending the economy-devouring Imperial War Machine and the lopsided wealth distribution. Some courts, we can see, still defend the right to attend a Council meeting and speak there for three minutes (even if you can’t get your subject on the agenda). But this whole issue doesn’t mean much in the day-to-day homeless life where basic concerns are denied like the basic right to sleep legally somewhere), the right to not have one’s property searched and seized arbitrarily, the right to protest these conditions, the right to fair treatment by public agencies and private businesses, etc. Still, while I’d have much preferred to see a successful assault on the Sleeping Ban (as was the case in L.A., San Diego, Fresno, and Laguna Beach), this seemed a good well-documented opportunity to force the City Council to cut back on its repression. This arrest in March of 2002 was the latest in a cycle of repressive incidents. The cycle of repression has continued. With Mayor Coonerty coming back into power with a right-wing majority on the Council, the federal courts and the streets may be the only avenues of redress. Hopefully this court decision–and a subsequent victory in the trial–will make the Coonerty Council and its cops more reluctant to stifle regular human dialogue and protest at City Council. 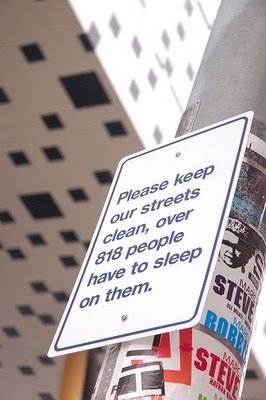 And perhaps cut short some of its homeless-ophobia downtown. “The City contends that only certain portions of its meetings are limited public forums and that no members of the public have any First Amendment rights at all once the public comment period has concluded. The City cites no support for this proposition, and there is none. In City of Norwalk, we held that city council meetings, once open to public participation, are limited public forums. 900 F.2d at 1425. A council can regulate not only the time, place, and manner of speech in a limited public forum, but also the content of speech—as long as content-based regulations are viewpoint neutral and enforced that way. period has closed. As we explained in Norwalk, the entire city council meeting held in public is a limited public forum. But the fact that a city may impose reasonable time limitations on speech does not mean it can transform the nature of the forum by doing so, much less extinguish all First Amendment rights. A limited public forum is a limited public forum. Perhaps nothing more, but certainly nothing less. The City’s theory would turn the entire concept on its head. objectives of the corrections system.”). When queried at oral argument whether that action would constitute classic viewpoint discrimination, the City responded that it was “just human nature.” We decline the City’s invitation to rewrite First Amendment law to extinguish the rights that citizens have when they attend public meetings. in any way they choose. Specifically, the City argues that it has defined any violation of its decorum rules to be a “disturbance.” Therefore, it reasons, Norwalk permits the City to eject anyone for violation of the City’s rules—rules that were only held to be facially valid to the extent that they require a person actually to disturb a meeting before being ejected. We must respectfully reject the City’s attempt to engage us in doublespeak. Actual disruption means actual disruption. It does not mean constructive disruption, technical disruption, virtual disruption, nunc pro tunc disruption, or imaginary disruption. The City cannot define disruption so as to include non-disruption to invoke the aid of Norwalk. legislative rather than administrative or executive. fourth factors clearly point to this being an administrative rather than legislative act. Thus, Krohn, Kennedy, and Fitzmaurice are not entitled to absolute immunity for their part in removing Norse from the meetings. Although the record is incomplete, it appears that in both 2002 and 2004 Norse was singled out for expulsion and arrest. Mayors Krohn and Kennedy did not take any formal legislative action, but rather ordered Norse out of the room. And both expulsions lacked the hallmarks of the legislative process. With respect to the 2002 arrest, Krohn ordered Norse to leave on Fitzmaurice’s motion without any debate. The motion was predicated on the “dignity” of the council rather than the council’s performance of its obligations to the citizens of Santa Cruz. And with respect to the 2004 arrest, the record does not reveal a motion based even on dignity, let alone a legislative decisionmaking process. Thus the decisions to expel Norse were administrative, not legislative, so the defendants are not entitled to absolute immunity. it’s clear that the council members aren’t entitled to qualified immunity. In the Age of YouTube, there’s no need to take my word for it: There is a video of the incident that I’m “happy to allow . . . to speak for itself.” see http://www.youtube.com/watch?v=ZOssHWB6WBI (last visited Nov. 16, 2010). This video (also found in the record) clearly shows that Norse’s sieg heil was momentary and casual, causing no disruption whatsoever. It would have remained entirely unnoticed, had a city councilman not interrupted the proceedings to take umbrage and insist that Norse be cast out of the meeting. Councilman Fitzmaurice clearly wants Norse expelled because the “Nazi salute” is “against the dignity of this body and the decorum of this body” and not because of any disruption. But, unlike der Führer, government officials in America occasionally must tolerate offensive or irritating speech. The Supreme Court long ago explained that “in our system, undifferentiated fear or apprehension of disturbance is not enough to overcome the right to freedom of expression.” Even in a limited public forum like a city council meeting, the First Amendment tightly constrains the government’s power; speakers may be removed only if they are actually disruptive. We’ve said so twice. In White v. City of Norwalk,we explained that speech must “disrupt[,] disturb[ ] or otherwise impede[ ] the orderly conduct of the Council meeting” before the speaker could be removed. …We upheld a spectator’s ejection from a public meeting only because he was “disrupting the proceedings by yelling and trying to speak when it was not time for” discussion..
Had he been given a chance, Norse could no doubt have presented lots more evidence that he never disrupted the Santa Cruz council meeting, but what would have been the point? The video speaks for itself: Norse raises his hand in a brief, silent protest of the mayor’s treatment of another speaker. The mayor ignores Norse’s fleeting gesture until Councilman Fitzmaurice throws a hissy fit. defendants point to Norse’s reaction to Councilman Fitzmaurice as the “disruption” that warranted carting him off to jail, Norse’s calm assertion of his constitutional rights was not the least bit disruptive. The First Amendment would be meaningless if Councilman Fitzmaurice’s petty pique justified Norse’s arrest and removal. Even viewing the facts most favorably to the city council members, their behavior amounts to classic viewpoint discrimination for which they’re not entitled to qualified immunity. And that’s what the district court should have held when it set about resolving qualified immunity as a matter of law. If it was going to take it upon itself to grant summary judgment to anyone on that issue, it should have been to Norse. On remand, the district court can set things right by holding, as a matter of law, that the city council members are not entitled to qualified immunity, and proceeding to assess damages. At 7 PM one of the two attorneys who argued the case before the court (and has fought this battle before a district judge (twice) and the court of appeals (twice) will discuss the case and its significance at 101.1 FM (http://www.freakradio.org). Call in questions and comments at 831-427-3772.